Post Office Farm Nursery is located in the beautiful Macedon Ranges north west of Melbourne. We specialise in the genus Helleborus having collected and grown them in gradually increasing numbers over the past 20 years. The owner of Post Office Farm, Peter Leigh began growing Hellebores as a keen amateur collector in the early 1990s. He began importing Hellebore seed from overseas and pretty soon ran out of room in his small Brunswick backyard. After studying Horticulture at NMIT and Burnley he moved onto 20 acres at Ashbourne, near Woodend in 2002. The nursery was established and plant sales began that same year. All of the Hellebores sold by Post Office Farm are grown from our own breeding stock. We have been passionately interested in breeding the best quality seed grown Hellebores since before the Nursery was established. We are constantly seeking to improve our Hellebores by our own breeding work as well as importing both seed and plants from the best overseas growers. As a production nursery we are not normally open to the public. However we welcome visitors to our nursery Open Days on Sundays over Winter and by appointment only at other times. 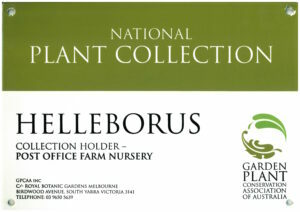 Post Office Farm Nursery is registered with The Garden Plant Conservation Association of Australia as the holders of the national Hellebore collection. We are members of the Nursery and Garden Industry Association of Victoria and are fully accredited under the Nursery Industry Accreditation Scheme.